The windlass mechanism of the foot is an important and integral structure for normal foot function. The windlass mechanism consists of the plantar aponeurosis, which is for all intents and purposes the same thing as the plantar fascia (I don’t want to argue semantics). It attaches to the plantar aspect of the heel, spans out across the plantar surface of the foot, to underneath the metatarsal heads to attach to the base of the toes. If you lift up any of the toes on a weightbearing foot, especially the great toe, you pull on the plantar fascia and the arch is lifted up, activating the windlass mechanism. This works on all toes, but is much more powerful on the great toe. The term ‘windlass’ comes from sailing where it is the winch mechanism where the rope is wound around a drum, so in the foot the windlass is the plantar aponeurosis being wound around the metatarsal head. 1. No Windlass. 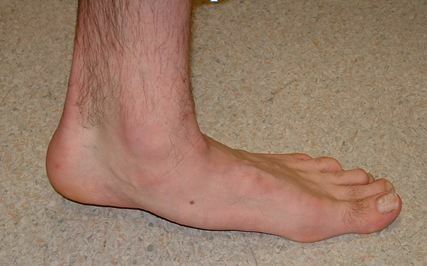 This can occur for one of two reasons: (1) the first MPJ does not dorsiflex the required range of motion, as in there being a hallux rigidus or structural hallux limitus present; if there is no hallux dorsiflexion, then there is no activation of the windlass mechanism; or (2) the plantar fascia is not there, as in a rupture (which I once had happen to me). The consequences of no windlass mechanism is that there is nothing to support the foot during the propulsive phase of gait when the loads on the foot are high and no supination of the foot when the tibia is trying to externally rotate due to moments from above. It is not hard to imagine the negative effects of that. (Nothing to do with running, but we previously reported that there was no windlass functioning in those with diabetes and Charcots neuroarthropathy, which probably explained why they have midfoot Charcots). 2. High force to get established. If you were to try and dorsiflex the great toe while weightbearing in a group of people, it is really clear that there is a wide variation of force needed to establish the windlass mechanism. Some are really easy and some are really hard and most differ between the left and right foot. Imagine if the force is really high, the loads that are probably going through the plantar fascia during gait (maybe this is a risk factor for plantar fasciitis? ), but also imagine how hard it would be to get the heel off the ground during gait. If the great toe joint is really hard to move, then the heel is not going to be able to come off the ground unless a lot of effort is put into it – imagine the load that this then puts through the tissues and the alteration to gait that occurs as the body tries to move that joint. The assumption is that this force to dorsiflex the hallux during weightbearing should ideally be as low as possible. If it is low, then the heel can be easily lifted off the ground without much effort, leading to less load in the tissues and a theoretical better walking or running economy. This is usually called Jacks test or the Hubscher’s maneuver. Technically, what we are really testing here is testing first metatarsophangeal joint dorsiflexion stiffness which is contributed to by many things, but the windlass is probably the most powerful or influential of them. In almost everyone you can lift the great toe off the ground when they are weightbearing (unless they have a hallux rigidus). I have probably seen about a dozen that no matter how hard I try I cannot lift the toe off the ground, despite them having a normal range of motion when the foot is off the ground. None of them were runners and all of them walked with a circumducting gait as it was the only way they could move ahead over the foot as that joint just would not bend when I tried to lift it and when they were walking. In an unpublished study of ours it was shown that the forces to establish the windlass mechanism are higher on the painful side in those with unilateral plantar fasciitis – this could be the cause of plantar fasciitis (ie the high forces going through the tissues) or it could be because the pathological processes of plantar fasciiitis altered the tissue properties to make it higher – it probably does not necessarily matter which it is, to get it better we probably have to lower that force. Our testing and the evidence of Koglar et al is that the best ways to reduce that force to establish the windlass mechanism to use orthotic design features that invert the rearfoot and evert the forefoot and to use low dye strapping (if applied correctly to plantarflex the first ray). 3. Delayed onset. The assumption is also that as soon as the heel comes off the ground and the load goes on during propulsion, that the windlasss should start straight away. Any delay in the windlass initiating is theoretically not going to leave the foot in a very good position to resist the loads that are just started being applied. When you try and dorsiflex the hallux in a group of people when weightbearing, it is certianly noticeable that some of them have 0, 5, 10 or even 15 degrees of dorsiflexion before you start to see the arch come up as part of the windlass mechanism. This theoretically means that this is how far the heel has to come off the ground during gait before you have a stable foot from the windlass mechanism. Look at this picture; I am sure you have seen feet like that before. This is nothing more than a delay in the windlass mechanism. This foot needed just over 15 degrees of dorsiflexion at the great toe joint before the windlass started working. As that joint has not gone that far in the photo, look what happens in the midfoot and the consequences of that. As soon as they raise up a few more degrees the arch will start to form as the windlass is now working, but its too late, the damage to the foot has been done. I did not address the issues of the windlass mechanism in my rant on the nonsensical understanding of “overpronation”, but hopefully you can see that no amount of minimalism or barefoot running, gait retraining or muscle strengthening is going to help this foot with no or very delayed windlass! (Those approaches can potentially help other causes of “overpronation”). What can you do for a delayed onset windlass – all you can do is tighten it up by lifting the heel (ie heel raise) and/or lifting up the great toe (eg Cluffy Wedge). Having said that, I am taking a guess here, as I not sure on this, but it is entirely possible that running with a forefoot strike might help if, for eg in the foot in the photo above, they keep running with that great toe joint not dropping below 15 degrees of dorsiflexion, but I do not think that this is possible (though I am happy to be convinced otherwise). Obviously the heel drop in a running shoe is a factor here and a zero drop would not be indicated if there is a delay to the windlass mechanism. Obviously we need to facilitate the function of the windlass mechanism whenever possible. This means that whatever we put on the foot or under the foot we don’t want to do anything to inhibit the windlass mechanism, unless there are compelling reasons and an underlying rationale to do so (and sometimes we do have to compromise foot function to achieve other aims). Stiff or rigid sole shoes will inhibit the great toe from dorsiflexing so can inhibit the windlass mechanism. Foot orthotics or inserts that are elevated under the first metatarsal head or inhibit the first metatarsal from freely plantarflexing will also inhibit the great toe from dorsiflexing and inhibit the windlass mechanism. As I am writing this I could not help but do thought experiments about how different running forms would affect this, but also reflect on how those that market promote different running techniques or forms try to spin this to point out that there’s is the best way to do it! I have seen a number of feeble attempts to do this, but they were just showing that they can spell ‘windlass mechanism’, and had no real understanding of it. I have seen a number of barefooters point out that shoes interfere with the windlass mechanism. The rigid sole shoes do (and we make use of these clinically when indicated), but, in general, shoes do not interfere with it. The barefooters stating it and wishful thinking does not make it true. If the windlass mechanism is not working, the first metatarsal head does not bear weight very well. Anyone with an in-shoe pressure measuring system can easily show the barefooters claims wrong by showing the weightbearing that goes on under the first metatarsal head inside shoes … ie the windlass is working! (unless there is something else altering the load distribution under the forefoot). Following on from that, we have done an experiment that unfortunately we never got around to publishing (…yet), in which we looked at first metatarsal head weightbearing in the most inflexible running shoe we could find at the time and on day one, there was reduced first metatarsal head weightbearing, indicating that perhaps the windlass was not working too well. This may be a risk factor for injury when going from old to new shoes. However, within a few days of wear the metatarsal head was loading just fine. Running shoe flexibility has improved a lot since then. I do not want to get into it here in any detail (I have written too much already! ), but for those familiar with the theoretical constructs of the rare, forefoot varus and the common, forefoot supinatus, we have data that suggests that forefoot supinatus may actually be a consequence of the soft tissue adaptations that occurs when the windlass is not functioning properly. Follow this thought experiment: if a rearfoot striking runner has a forefoot supinatus and they transition to forefoot striking, the increased activity of the posterior tibial muscle is going to invert the rearfoot more; this means that there will be a tendency for the first ray to plantarflex, leading to a correction of the forefoot supinatus contracture over time, giving the appearance of an increasing arch height from a better functioning windlass mechanism. I have not yet brought into the statements and wishful thinking that increased muscle strength from barefoot or minimalism running increases the arch height for 3 reasons: (1) the tiny little intrinsic muscles mostly run parallel to the metatarsal shafts, so how can they have any sort of lever arm to planterflex them to increase arch height? (2) one study has shown no correlation between arch height and muscle strength; and (3) we know from neurological patients that when there is an isolated atrophy of the intrinsic muscles, that the arch height actually increases. The correction of a forefoot supinatus contracture in minimalism or barefoot running is a more plausible explanation for the increase in arch height some report. This will only happen if there is a forefoot supinatus present to start with (and this is still a theoretical construct). Part of my motivation for this article was the comments I made on this study on patellofemoral pain and foot orthotics that I called fatally flawed as the “orthotic” was just a full length wedge and not really an “orthotic” that I suggested would inhibit the windlass mechanism. Hopefully those not familiar with the windlass mechanism can now see why I made those claims after reading this what I wrote above . As the “orthotics” in that study had a wedge that went under and elevated the first metatarsal head, that would potentially interfere with first ray plantarflexion and the windlass, potentially pronating the foot more. I gave my views on the woo being touted by Barefoot Science for their insoles here. The design of their insole would easily facilitate the windlass mechanism and easily account for any therapeutic benefit of their insoles and easily have nothing to do with the foot muscle strengthening system they claim in the absence of any supporting evidence. I have seen many claims that a tight plantar fascia can interfere with running and testing it can be one of the tests you should do before starting minimalism or barefoot running. I have never seen a tight plantar fascia except in those with genetic conditions such as foot equivalent of Dupuytren’s contracture (and they tend to have a high arch foot and the great toe is really easy to dorsiflex). I just do not buy the claims and think that those making them are confusing this with the high force to get the windlass established. Imagine if the plantar fascia was not “tight”? – the arch would collapse!! In all the testing we have done (and I have a device that measures the forces to achieve this), no exercises reduced this other then in a very temporary way. Obviously a lot more work needs to be done on this. Above, I have touched on number of issues in a very superficial way. Hopefully that superficiality does not lead to confusion and people going off half cocked. If you have any questions or want any clarifications, ask them below and I will see what I can do (or have a look at all these discussions on the windlass mechanism). As always: I go where the evidence takes me until convinced otherwise. There was not a lot of research referred to above, but there is quite a body of literature that underpins the above (I have 3 publications contributing to it). The above is consistent with all that literature (I just did not add references as this is blog post and not a scientific review! … and I am lazy today – its school holidays and I with my girls!). I just responded to a question via twitter re calf muscle stretching. I had an honours student do a project on that and the windlass forces and we found no decrease in the force to dorsiflex the great toe (ie establish the windlass) following stretching. Having found that, there is still good evidence from a RCT, that stretching the calf muscles works for plantar fasciitis. Anatomically, fibres from the achilles tendon do pass around the heel to the plantar fascia, so there are links there and there are some interesting concepts in the role of fascial winding of the whole body and the link the windlass mechanism may have to that process. Do you think that by testing 1st ray function through Jack’s in a full weight bearing bilateral stance might be invalid. 2nd – it’s assumed windlast is being assessed during a foot position that closely resembles mistance (well close as possible in a bilateral standing configuration). Therefore forces acting on the foot at this time will be greatest at dorsiflexing the 1st metatarsal. As the leg progresses over the foot after midstance and the STJ begins to resupinated in response to external rotation moments proximally, would the 1st metatarsal not naturally plantarflex? Maximal forces acting to dorsiflex the 1st metatarsal would continualy reduce, and rising of the heel would progressively elevate the proximal metatarsal relative to its distal head. Could you explain in a practical hands on, everyday way the concept of “reverse windlass”. I know this is a running blog but I have been testing all my DM patients for toe grip strength and FEWBT [for reverse windlass ?] and all so far have failed – even my low risk stratification. Should I then be more proactive in preventing or delaying deformity and loss of function from the very early days of diagnosis of DM ? im a student at a physical therapy university and since i’m going to start my undergraduate research project soon, I’ve decided to cover the windlass mechanism as topic it (dissertation work). It is my first time working in the research field, and to be fair i have some confusion on how to develop and answer the main research question that is based around the windlass mechanism. Having read through your research works and other’s works i found the following statement “the force generated by calf muscles are higly interdependent (Carlson, Fleming, & Hutton, 2000)”, which suggested me to promote my research work and to explore further on this “correlation”. According to this, what i’m trying to prove with my research is that, physical therapy techniques such as MET or PNF on the triceps suare could generate an improvement on the windlass mechanism. 1- Do you think is it possible to measure the windlass mechanism in order to establish what is an improvement of its function? 2- If yes, how could i measure it? 3- What factors or variables should i take into account from which the windlass mechanism depends on? I must tell that i feel quite perplexed about the outcome of my question at this moment. If you could help me understanding the windlass mechanism a bit better or perhaps giving just some tips in general for my research work, it would be very much appreciated. The forefoot varus is congenital or inherited. It’s what I call an Inherited Biomechanical Functional Element as it’s how the foot merely functions in this region on its own, as an isolated measurement. Furthermore, with most Forefoot Supinatus is what’s actually acquired and developed to adapt and improve one’s gait cycle or walking motion. The body does this subconsciously to improve its own biomechanical efficiency. A good example of this that I have found clinically over the past 17 years is with patients presenting with a structural leg length discrepancy (LLD). The longer leg will be in greater contact with the ground owing to an increase in further body weight going down the longer leg. This can be with a LLD measurement of between 5mm to 6mm an extra 20% to 25% more body weight going down the longer leg. Which Craig does cause further pronation of the foot of the longer leg. With this greater contact and pronation of the foot the forefoot varus will measure higher in order to create more time and slow the gait cycle action for the foot to get the 1st Ray or big toe through the entire gait cycle. The opposite occurs with the shorter leg as the gait cycle is sped up in order for the forefoot and toes to get to the ground quickly, to toe off. What I’m stating here is factual clinical biomechanical knowledge based on the fact that most people presenting to my sports clinic with rolled ankle joints are generally assessed and found to have 2 major factors; 1. a LLD and 2. A high forefoot varus measurement of the longer leg, which is what, creates an unstable foot motion. The measurements don’t lie.